Our San Antonio team building office is the world-headquarters of our team building company. As a result, all of our team building events are offered in San Antonio, Austin, and all of Central Texas. If you have a meeting or convention in San Antonio, we have great news. Since our warehouse is right here, this is the least expensive city in the world to conduct a team building activity. Also, the Riverwalk is a fantastic place for a Camaraderie Quest team scavenger hunt. We have a number of local instructors in the area as well. Another great benefit for our headquarters being in San Antonio is that our events are more cost-effective to deliver. Without shipping costs added to your tuition, local companies get a fantastic tuition on every event! Team Building Events in San Antonio, TX. 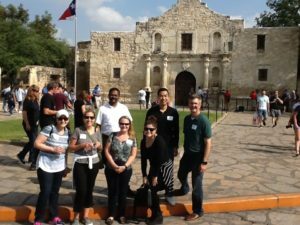 A Few Recent San Antonio Team Building Events.